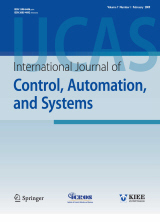 Abstract : "Planning the manipulators’ task sequences is necessary for proper execution of specific robotic tasks. With multiple manipulators for cooperative tasks, planning becomes difficult owing to possible collisions between component manipulators. This paper proposes a shadow space approach that utilizes the swept area of a robot during its motion, for collision-free task planning of dual manipulators. A collision can be detected and prevented by computing the intersection of two manipulators’ shadow spaces. Then, a novel genetic algorithm with mutually exclusive chromosomes is proposed to search optimal collision-free task sequences for dual manipulators. For a pragmatic example of placing pemnuts onto the back-chassis of a liquid crystal device (LCD) panel, experiments and simulation show that the proposed method can determine a nearly optimal sequence, which allows two manipulators to move cooperatively without collisions, even though they share a common workspace." Keyword : Collision avoidance, dual manipulators, genetic algorithm, task sequence optimization.